was created by Lisa Swifka in 2007 as an event hosted to connect bloggers with one another around the world. Each blogger who participates hosts a giveaway as a little gift for popping by. loves to work with rich and exotic fabrics. just leave me a comment below. that you have an active blog of your own. and make new friends and connections. Love and thanks for sharing in this with me. Oh boy, I get to be first! i guess you have to wait a another hour for mine. This will be my first time participating. Always love what you do and what you put on your blog. I'm so excited by your work! I have a million things I'd like to ask you. It's all soooo beautiful! This is my first participation, but I usually leave a little note in my visits, why not today. 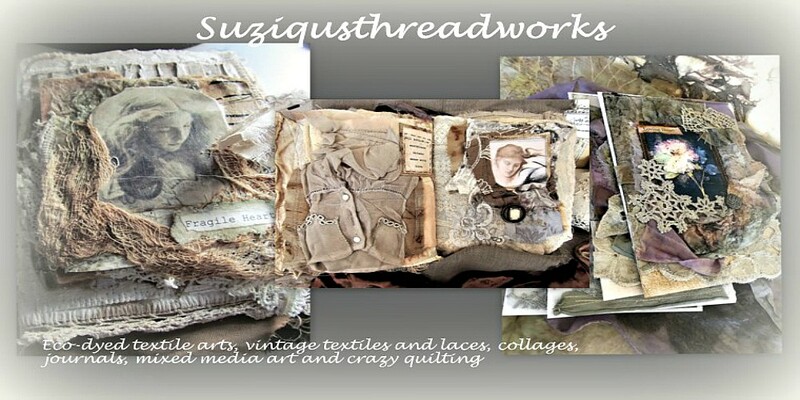 Your work and your blog are a favorite of mine Suzi! Do I see green velvet in your giveaway? If so, I'm in heaven just thinking about the possibility of what I can do with it and the other beautiful items. Have a wonderful day. the one shown above is wonderfull, dear . I would love to win some of your work. I am a follower and I have enjoyed the progression of your journal. Fantastic work! I love all the layers and layers of beautiful color and texture. Anything made by Suzy would be a welcome addition to my collection. I am wishing myself good luck. Please do include me in this sweet giveaway! What an exquisite piece of lace I spy among the goodies! Let the drool dreaming festival begin! Suzy your work is amazing and so is your giveaway, I would love a chance to win your prize. Oh Soooozzzzzeeee, you know I would be thrilled to win your giveaway. Please count me in my friend! Look at those goodies Suzy! Count me in. I'm participating too so drop by. Your work is absolutely FABULOUS!!!!!!!!!!!!!!!!!!! fantastic giveaway!! count me in for the drawing please. Oh wow your work is Amazing!!!!!! Wonderfull blog, and lovely giveaways. I am OWOH participant too (# 128), feel free to visit my blog. Suzy, Suzy, Suzy, I love your work. I've always wanted to try it. Your pieces inspire me. Oh, those are lovely prizes! I'd love to win them :) Please enter my name into your draw! And pop over to my blog and enter mine, too, if you haven't done so already! How lovely! I would love to win it! Please come to my Blog to win a real crystal ball! your giveaway is totally lovely - please add my name to your drawing! and please enter my own giveaway on my blog. In love with your blog...wonderful giveaway! I would love for you to come to mine and follow too...love new followers but most of all I love new friends! What a great prize !! Thanks for the chance and happy OWOH !!!! HI! What a gorgeous gift!wow. Please, count me in! I absolutely have to add my name for this draw!! Winning a piece of art made by you would definitely be a dream come true! Hi! Nice to meet you and see your awe inspiring blog! I love your talent and would love to win a piece of it! Greetings!...So pleased to visit your lovely blog. I am a Canadian Mixed Media and Digital Artist and look forward to meeting a new friend. I hope you will visit my blog as well. Thank you for including me in your wonderful gift draw. Hugs, Gayle. Thank you for giving us the chance to win your great doorprice. Your creations are awesomePlease count me in. Come visit me on my blog,I join the OWOH- event too. Thank you for taking the time to offer this lovely gift and thank you for the opportunity to win! Fantastic giveaway! You have so much talent! Glad I stopped by. Wow! Such a fabulous blog! I've enjoyed taking a look around and getting to know you a bit. G'Day from Brisbane! This is a very nice giveaway! Fantastic giveaway! It is so much fun seeing all the different types of things being given away and meet new(to me) bloggers! Please enter me in your giveaway! What a great give away, I hope you'll stop by mine. I love your blog Linda please add my name to your prize. Hope you have oodles of fun during OWOH. You have a lovely blog, and everything you create is wonderful. Thanks for your generosity and participation in the event. Count me in please. What a lovely giveaway. Please include me in your drawing. What a great give away! I would be thrilled to win! Nice to meet you! It's my first time here. I took a look at your etsy shop and I just love the rich fabrics you use on your pieces. I am also a lover of vintage things, and the doilies and purse would find happy homes here. I am keeping my fingers crossed! Thanks for the chance to win! Oh Suzy i am over the moon that you are having this giveaway,i adore your work so much. Hi and so nice to meet you. Your giveaway is beautiful and I would love a chance to win! Great giveaway! Please count me in! Hi Suzy... Thank you for visiting my OWOH post and leaving such a lovely comment. I love your 'door prize' too, especially the way you have used the fabrics and fibres on your collaged card, please count me in. HI Suzy, oh yes I do find your journals beautiful and inspiring. I will have to spend more time looking around your blog. I love all your layers. Thanks for stopping by my blog. Hi Suziqu. Thank you for opening your Blog Doors to me. 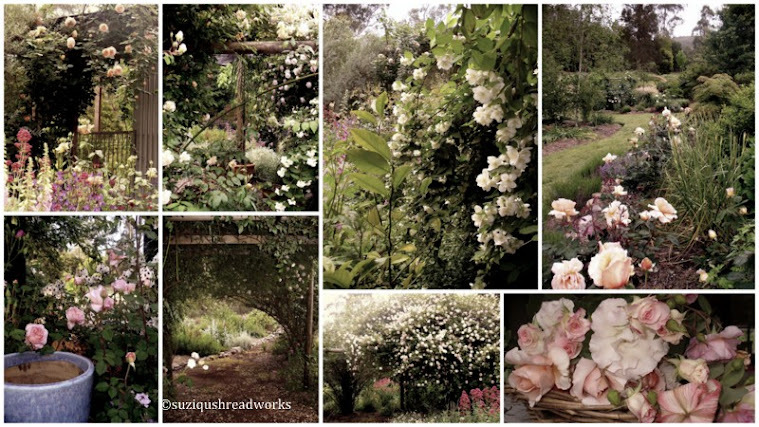 Your creations are truly lovely and very inspiring to me as a somewhat new blogger! I had a great time visiting and have become a follower. The textures you create are amazing! Suzy, your work is gorgeous! Ok, fingers are crossed please enter me for a chance to own one of you beautiful pieces! What a great giveaway. Your work is truly inspiring. Good luck in your entries. I'm enjoying the OWOH adventure. I've been a follower of yours for some time now and I love coming here to view your gorgeous books and your flowers. Please add my name to your draw. How I would love one of your pieces. If you have time, stop over for a visit to number 92. Those photos of your garden flowers are stunning...I am so envious! Also, glad to find a fellow crazy quilter among all of the paper and mixed media artists too! Yeah! I'd love to win your prizes...so keeping my fingers crossed. I'm your newest blog follower...took a few minutes to scroll through your sidebars...hard to read burgundy print on wine background. But, I did it! Your artwork is beautiful and your country rose garden is amazing. What a perfect place for a stroll! Thanks for entering me in your giveaway! Your work is incredible and I would love to win! Yea! So glad to be here. Please enter me in your drawing! Thanks! Yes, add me to your draw list, please! This is a gorgeous giveaway Suzy, would love to win! If you have time, please come and visit mine. What a wonderful giveaway! I found your blog awhile back and visit all the time! I love, absolutely love all of your collages and admire your talent for putting colors and fabrics together. Just gorgeous! I am envious of your beautiful flower garden. Being in the middle of winter here, it is inspiring and I can't wait for spring to get here! Please enter me in your drawing for your lovely give-away gift. I love the lacey treasures, so feminine! If you haven't already, I hope you'll drop by both of my giveaways (at Twigs and Tulle and Kindergarten's 3 R's: I'm giving away a mini bunting and some pattern blocks) during this awesome blogging event! Happy OWOH! Please stop by my blog and enter my OWOH giveaway also! I'm #590. Oh how I love vintage and lace and that beautiful tapestry purse! Please include me and visit my blog for giveaways of all natural body butters that I make. I had a great time visiting your blog. Please stop by mine. Make sure you come by and enter my own giveaway if you haven't done so already!! Beautiful blog and giveaway. Thank you for visiting my blog, too! Lovely giveaway -I love textile art. Looking forward to visiting your blog often. your giveaway is gorgeous ! wish I won it ! Thank you for giving me the chance to win your great prizes.Love the textile art and the prizes!They are really cool. Please visit my blog during the OWOH event. Regards from Australia and happy OWOH! Your fabric collage card looks very interesting. I like the how layers work together. YES! When my eyes laid upon the textiles in your header photo, my heart went pitter patter! All things textile and fabric speak to my heart so count me in, please. When you've time, please visit Thistle Cove Farm. Hi, I couldn't agree with you post more ... this is such a great way to connect. Your work is beautiful and you have a lovely gift away! I will stop by again when the flurry is all over! Very best wishes and habe a great time with this! Hi Suzie, Please count me in for your wonderful giveaway! 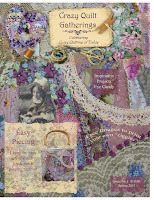 I would be thrilled to win your gorgeous card, the tapestry purse and the lace doilies. I use lace doilies or parts of them in lots of my creations. Beautiful blog! Love all your artwork and would love to win one of your gifts! Your blog is lovely, and your fiber art is gorgeous! Thank you for participating in OWOH 2011. Pop by my blog, #51, if you get a chance. Your fabric work is amazing! I just love looking at fabric collages being afraid of my sewing machine. lol Awesome to meet you! If you haven't already, you're welcome to visit my OWOH post anytime! I'm going to go browse you blog now - it all looks so gorgeous! Thx for the great giveaway! 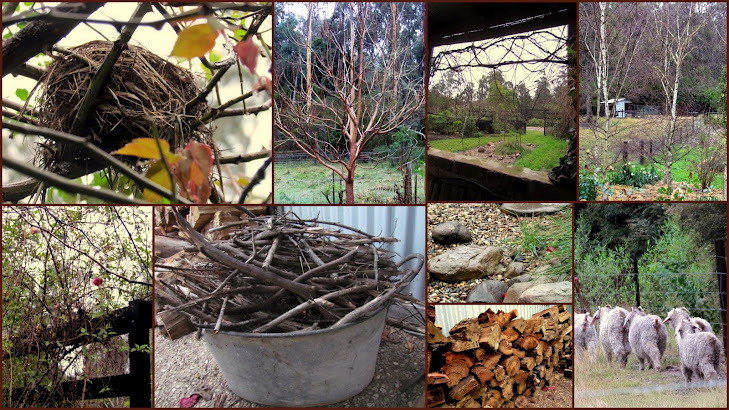 your garden pictures are so special! I love flowers! sweet blog & lovely offerings!you are truly a lover of the beautiful, and gifted artist!! blessings & warm hugs from Montana!! Suzy, everything you make is soooo beautiful! What a wonderful collection of fabric goodies, I'd loev to be included, i'm Lynn and #65 on the list, stop by if you havent already! wow! The purse is wonderful! I’d love to be a lucky winner! Oh I'm in love with your blog Suzy...I'm bevie from the mountains of VA. Your art is awesome, do add me to your list, then pop by my blog!!! Great giveaway. I love every thing vintage. Thanks for visiting my blog. Gorgeous work! I will definitely be following your blog from now on!! Ciao Bella! This is my first trip on OWOH and it has been an adventure. So many generous and talented people. I am so glad to meet you too~ If you get the chance please wander my way #476 on the list. Nice to meet you and visit your blog. Winning your give away would be awesome! Thanks for including me in your drawing..Come visit me, I am playing too. 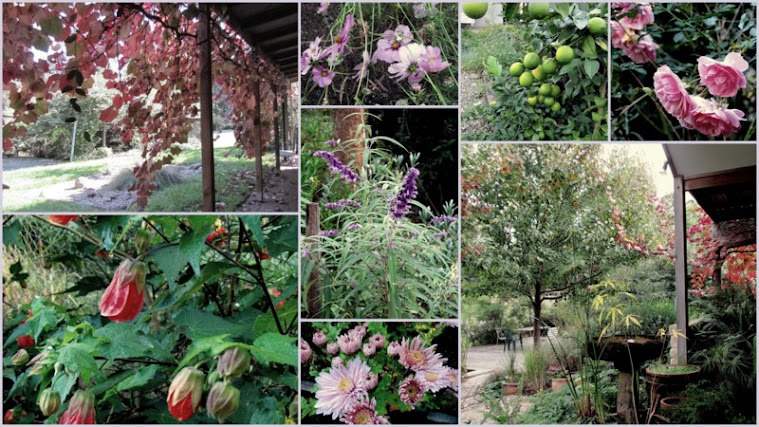 Your garden is breathtaking, and obviously inspires your colorful work. I would love to win your beautiful gifts! Please enter me in your giveaway, and stop by my blog to enter mine! Your old world roses quilt is phenomenal. Such rich fabrics and intricate work. I absolutely love your work. Would love to be the lucky winner but will definitely be following you from now on. Can't wait to see what you do next! I think you have a beautiful blog and I love all the vintage treasures you are offering as a door prize. Please include me and when you get a chance please visit my blog as well. Oh my gosh, Suzi, I didn't know you were do the OWOH challenge!!! I just decided to stop by and wow, here you are in it...lol SO beautiful!! What a phenomenal prize. How have you been? I have been a busy bee! I would love to win something so wonderful! Thanks for the chance to win. Wow, these are lovely giveaways. I remember the my grandmom used doilies. Please enter me in your contest and come over to enter mine-#348. I really like the vintage look and would love to win your giveaway. Hello from Singapore. what delightful creations to be won! greetings from frigid new jersey! Such a lovely blog and a fun giveaway. Please enter me and thank you! Hi Suzy it's lovely to meet you and see some of your beautiful stitched works of art, this is exactly what I was hoping to find along this journey. I hope you'll stop by and see my giveaways too on my blog. Suzy....your work is amazing. Thank you so much for allowing me to wander through your world. I hope that you will come and visit me on this awesome OWOH journey. #104 Southern Ooaks. What talent you have. I took a quick look around your blog and was quite impressed. I'll be back after the event. I'm # 11, and would love to have you stop by if you haven't already. I would love to win your beautiful giveaway! Please put my name in the hat for a chance in your drawing. Gretings From Cornwall, these are fabulous creations I wouls just love to win, such a fun way to meet new friends! Hi Suzy, i love your work it's very inspirational and beautiful. Would love to win your giveaway. Hi Suzy! Your work is beautiful. I have started my own blog a few months ago and am a crafter and lover of all things fabric and fibers. Your give away prize is divine!! Please enter me in the drawing! What a luscious and exotic place to land on this incredible OWOH flying adventure... so much lavish colour and inspirational richness to delight the soul. When I arrived I was completely entranced by your sumptous Pre-Raphaelite book - so much detail and texture! Will wander around some more now but will definitely be back! Truly gorgeous! Thank you! Hello from Oregon! I have enjoyed peeking around your blog. Thanks for the chance to win your giveaway. I read about your work and your blog on Mary Anne's blog in Canada. She was right - your work is outstanding and I am very impressed. Plus you appear to be a wonderful gardener. it seems to me that the majority of CQ gals are also great gardeners. Must go together. I have a blog so come visit me sometime. Thank you for stopping by and entering my OWOH giveaway as well. I will definitely be coming back after this event for a longer visit! Wow- what lovely giveaways!!! I'd love to be entered into your drawing! Please check out my blog for my OWOH giveaway! You do beautiful work!! Thanks for the chance at your doorprize! Stop by my giveaway as well. Thx for stopping by my blog during the OWOH event. Love your beautiful prizes!! Great blog. What a wonderful giveaway. Thank you so much for offering it! I would love love love to add this pretty purse to my vintage purse collection!! I would be honored to win. 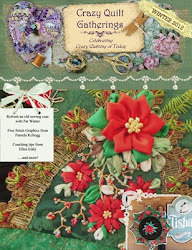 Your fabric collage card is fabulous! Your Pre-Raphaelite Women Journal is amazing and the pictures of your indoor/outdoor space and outdoors is gorgeous! Thank you so much for the chance to win! Thanks so much for visiting!!! It's so good to hear from you. I hope you're having a good weekend! So beautiful! Please count me in! Greetings from far off Cody, Wyoming! Isn't this event fun? What a nice blog you have! Your offering is awesome...love it, so pretty. Please enter me. If you have a moment stop by and enter my giveaways too. PS. Suziqu...I wanted to ask if you made the crazy guilt piece on your header...it is so beautiful! What a gorgeous giveaway. i have a number of vintage doilies in my textile collection. Thanks for visiting my blog! I've had a look at yours and your work is AMAZING! Isn’t this fun? I just love OWOH! Thank you for participating… please count me in for your terrific giveaway. If you get a chance, I hope you’ll visit me too (if you haven’t already). I had no idea there were so many wonderful blogs of vintage finds! I need to get out more often. Thanks for sharing your gifts. Good wishes to you and happy blogging. Please include me in your drawing. Come visit my blog. 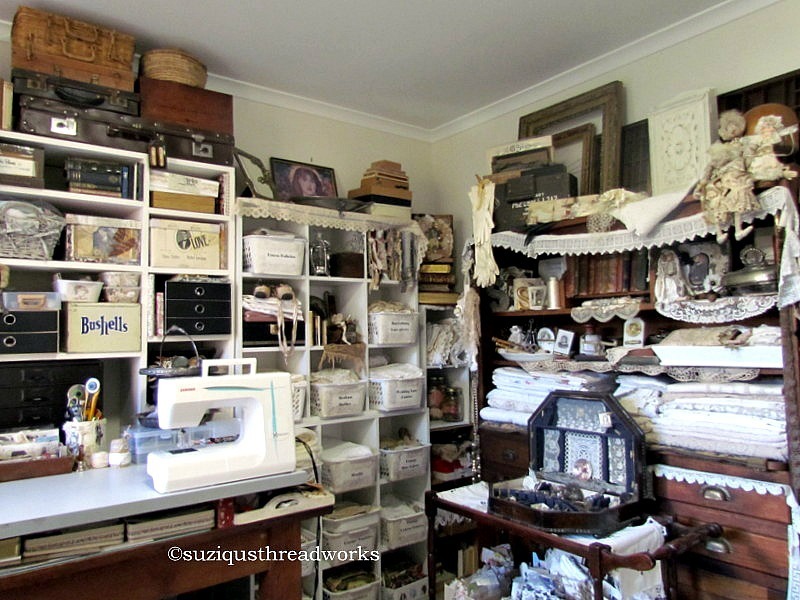 I love your crazy quilt creations- and what glorious fabrics you use. I love doilies and tapestry and other such fabrics though I do not quilt much with them myself. I hope you are having a wonderful festival and are getting the chance to meet other bloggers on your journey. There are so many terrific posts to read. I am a quilter and person who plays with beads from Western Canada. I have added you to my blog list so I can read more about you after the festival is over. Hello from Canada! I love, love, love the bright colours of your work. The fabric card is especially lovely! wow- such a generous giveaway! I love everything! please come visit my blog too. Thank you for for offering this beautiful gift and thank you for the chance to win. Your hard work really shows! Well, hello there from snowy Arkansas! Please enter me in your fantastic giveaway and if you haven't already, be sure to stop by my blog and enter my giveaway, too. Hello from Navada! I love your giveaway! Please count me in! Thank you!! I think there is more to explore here but it's late so I'll book it for later! Come see my blog if you have a chance. Greetings from Canada! Thanks for your visit to my blog. I always enjoy meeting another lover of fibers and fabric! So glad that you're a part of OWOH! Hi Suziqu and greetings from another Aussie in rural NSW. Great to meet you and visit your gorgeous blog. Your roses are wonderful and is your beautiful art. I would be thrilled to be the lucky winner of your gifts. Please come by #9 and say hello. Suzy, It is so wonderful to meet you. What a beautiful giveaway. Happy OWOH. Please stop by during your journey. You are so creative ...and patient! Work like yours must take a lot of time and effort. I like sewing myself and working with fabric but my projects have to be finished fast... or they get forgotten! Would love to win your giveaway so pls count me in! thanks & be blessed! Greetings from Massachusetts, USA! Thanks for visiting my OWOH post! Love your blog! Fabulous prizes! Thanks so much for the chance to win. Your blog is just lovely. I have become a follower and look forward to looking at everything. I want to thank you for stopping by my blog and leaving such warm comments. Please add my name to your wonderful giveaway. Greetings to you Suzy! You have such a wonderful blog and your giveaway is fantastic. You truly are a creative individual. Include me in your giveaway. Wow what a lovely giveaway! Please add me to the list !Thank you for the opportunity to win! Hi, so nice to meet you. A big hug from Spain. Your work is so beautiful- I love the rich fabrics that you choose. Please add my name to your generous give away and stop by my blog if you are able-lucky #777 on the long list. These are all three beautiful prizes. 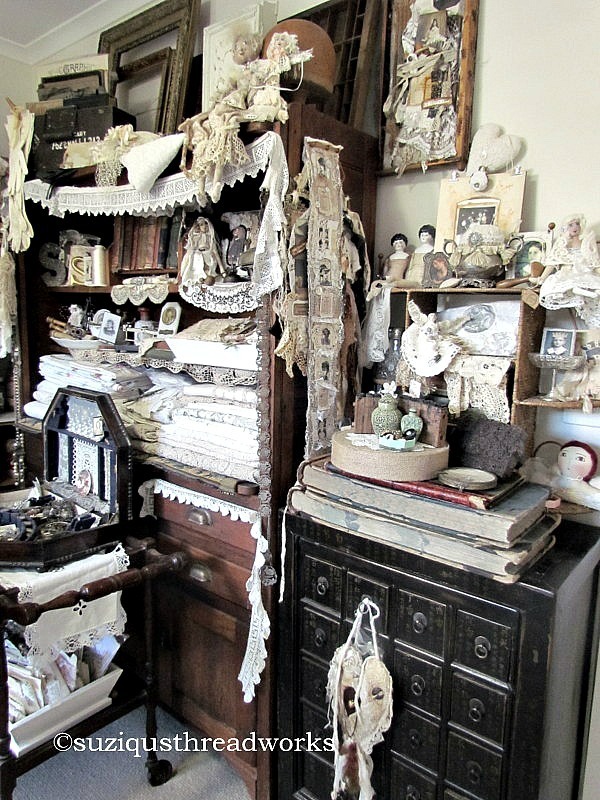 I could always find a place for more vintage doilies and I love your collaged piece. Please add me to your giveaway and come over and visit me. I am No. 229 on the list. Creating for me is essential! It feeds my heart and soul. It is a large part of who I am. I have a passion for vintage fabrics, silks, velvets, laces and embellishments inc. jewellery which I incorporate into my collages for journals etc. My love also of antiques, time worn treasures - all things tarnished, tattered and pre-loved goes hand in hand with my creativity but above all I try to live a simple self-sufficient rural life style with my husband inspired by the natural beauty that surrounds us here. 2 Bags Full - My adventures in travel, knitting, and the blessings of my every day life. Please Check out My Archery Video! Laughing is important to me- especially at the moment!! Getting used to a different life. Where did those 3 months go? All rights reserved. Please do not copy, download, use or print any of the images on this site without permission first. Please have a heart! "Lady Clare" Textural art card. Antique Lace meets new lace in a Jewellery Keepsake. 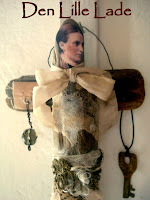 Art Angel lace and fabric doll - Jeanne d'Arc inspired. Angel journal. Collage "Sewing Mends the Soul"
Collage of Anna Pavlova "Lost Love"
Collaged Wallhangings - Little Button Boots and All Dressed Up. Fabric Altered Book "Pandora's Box"
Fabric and lace collage "Angels Rest in Peace". 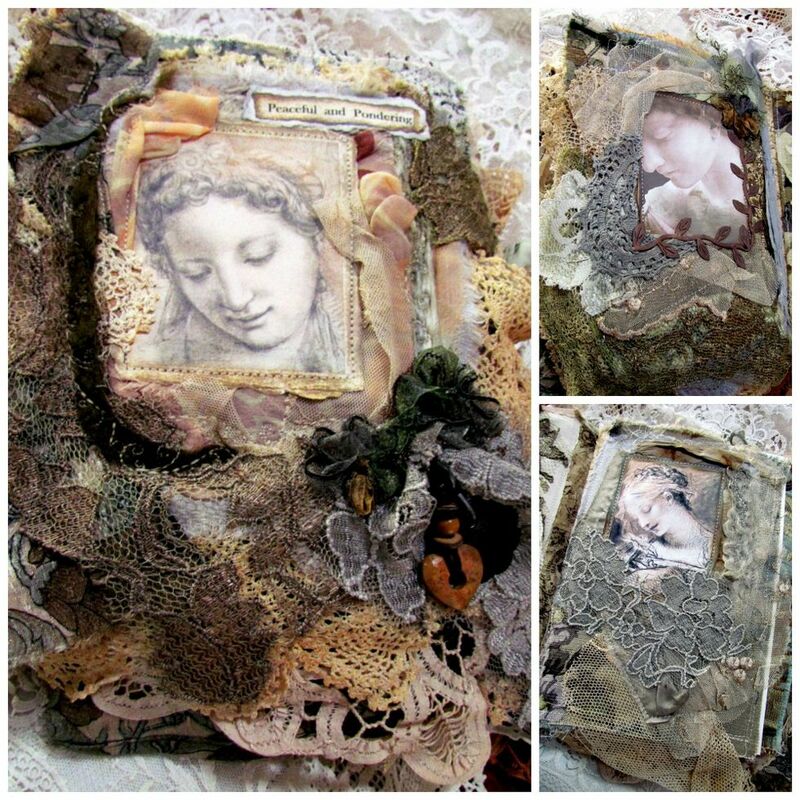 Fabric Lace Book / Journal "Peaceful and Ponderiing". Fabric Lace Book Peaceful and Pondering pages and Workshop examples from others. Fabric Lace Book/Journal class introduction and class. Fibre and Lace Art Card. Fabric and Paper journal "Reflecting and Collecting Thoughts" - a glimpse. gift from Marie and a gift created for Ros. 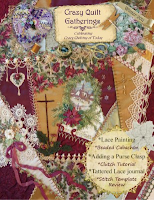 Giveaway winner to celebrate my on-line fabric and lace book / journal. Heart card and lace heart.Giveaway Notice. Journal - The Gift of Friendship. Journal for a Special Friend! Lace and Fabric Collage "Queen of Hearts"
Lace book "Catching Innocence" sneak peek! Peaceful and Pondering. Giveaway for Class Collage Wallhanging. Romantic card and "Love Grown" note book. Scattered whispers on the breeze"
Shabby Vintage/Antique Lace Jewellery Keepsake. silk corsages and fabric beads. Simply Neutrals No. 20 Sympathy Card. Simply Neutrals Tuesday No. 25. Lace Hearts for Birthday cards. Simply Neutrals Tuesday No. 43.Vintage and antique lace and doilies. Doilies for sale. teddies and toys. Arthur Rackham images. Todolwen new blog link. two vintage linen jewellery keepsakes/card folders. Valentine fabric and lace pack. Vintage Needle Keep. Spring pastel fabric packs. vintage tapestry fabric. Journal "The Dream of Dance". vintage winged angel and praying child.